It also contained 6.5 feet dot paper garland (pink gold). And 9 pcs hanging swirl. pink and gold party supplies t will light your party and make high impact. Hang on tables, walls. Lightweight, easy to hang them on the wall, above the table, in the hallway, on the tree, etc. - 100% SATISFACTION GUARANTEED: We're Absolutely Sure You'll Love Pink Party Supplies, However To Make Sure You're Confident With The Purchase, We Offer LIFETIME WARRANTY! If There Is ANY Fault with the Party Decoration Kit Let Us Know and We'll Ship Out Another Or Give You a Full Refund! Order Now with Confidence! 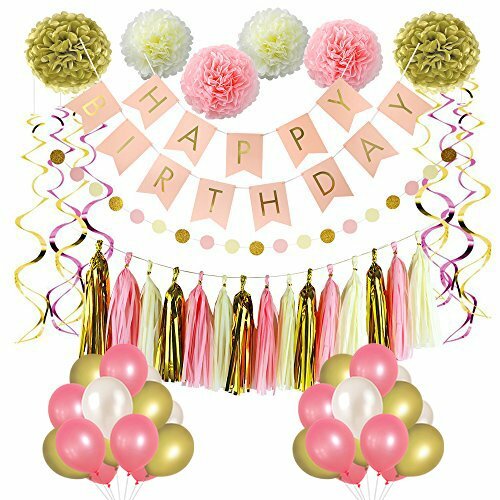 - DECORATIONS SET INCLUDING: 6-IN-1 Pink Birthday Decorations - 27 Pcs Party Decorations Balloons, 6 Pcs Paper Flowers, 1 Pcs Happy Birthday Bunting Banner, 15 Pcs Paper Tassels, 1 Pcs Dot Paper Garland, 9 Pcs Hanging Swirl Decorations. Our Complete Set of Pink and Gold Party Supplies will Add an Amazing Finishing to Your Birthday Party.Perfect for Desert Tables Backdrops and Overall Party Space. - PERFECT PARTY DECORATIONS: Litaus's Party Packs Decoration For Birthday Party Is Created With The Mission To Leave Everyone With Beautiful Memories! We Can Only Imagine How Our High Quality And Amazing Set Of 6 Decoration Items Can Help You Light Up The Beautiful Night And Make This An Unforgettable Moment For Your Kids, Yourself, Your Family And Friends. - COMPATIBLE OCCASION : Garland Decorations and Hanging Swirls Are Awesome Addition To Girls First Birthday Decorations And So Verastile. Hang On Tables, Walls. It is a Great Table Settings For Girls Birthday Party. They're also Fabulous To Use as a Photography Backdrop! Lightweight, Easy to Hang Them On The Wall, Above The Table, In The Hallway, On The Tree, Etc. - EASY TO ASSEMBLE: Girls Birthday Decorations Has an Instruction to Assemble Step By Step. We Provide The Detailed Iinstruction For Paper Flowers, Tissue Paper Tassels. Very Easy To Operate and Décor Birthday Wedding Party, Great Choice Of Girl First Birthday Supplies.